History of ice creams probably began around 500 BC in the Achaemenid Empire with ice combined with flavors to produce summertime treats. In 400 BC, the Persians invented a special chilled food, made of rose water and vermicelli, which was served to royalty during summers. The ice was mixed with saffron, fruits, and various other flavours. During the 5th century BC, ancient Greeks ate snow mixed with honey and fruit in the markets of Athens. Hippocrates encouraged his Ancient Greek patients to eat ice "as it livens the life-juices and increases the well-being." A frozen mixture of milk and rice was used in China around 200 BC. "They poured a mixture of snow and saltpetre over the exteriors of containers filled with syrup, for, in the same way as salt raises the boiling point of water, it lowers the freezing point to below zero." In the sixteenth century, the Mughal emperors from the Indian subcontinent used relays of horsemen to bring ice from the Hindu Kush to Delhi, where it was used in fruit sorbets. Kulfi is a popular frozen dairy dessert from the Indian subcontinent and is often described as "traditional Indian ice cream." It originated in the sixteenth century in the Mughal Empire. When Italian duchess Catherine de' Medici married the Duke of Orléans (Henry II of France) in 1533, she is said to have brought with her to France some Italian chefs who had recipes for flavoured ices or sorbets. One hundred years later, Charles I of England was reportedly so impressed by the "frozen snow" that he offered his own ice cream maker a lifetime pension in return for keeping the formula secret, so that ice cream could be a royal prerogative. There is no historical evidence to support these legends, which first appeared during the 19th century. The first recipe in French for flavoured ices appears in 1674, in Nicholas Lemery's Recueil de curiositéz rares et nouvelles de plus admirables effets de la nature. Recipes for sorbetti saw publication in the 1694 edition of Antonio Latini's Lo Scalco alla Moderna (The Modern Steward). Recipes for flavoured ices begin to appear in François Massialot's Nouvelle Instruction pour les Confitures, les Liqueurs, et les Fruits, starting with the 1692 edition. Massialot's recipes result in a coarse, pebbly texture. Latini claims that the results of his recipes should have the fine consistency of sugar and snow. Ice cream recipes first appeared in England in the 18th century. The recipe for ice cream was published in Mrs. Mary Eales's Receipts in London in 1718. Take Tin Ice-Pots, fill them with any Sort of Cream you like, either plain or sweeten’d, or Fruit in it; shut your Pots very close; to six Pots you must allow eighteen or twenty Pound of Ice, breaking the Ice very small; there will be some great Pieces, which lay at the Bottom and Top: You must have a Pail, and lay some Straw at the Bottom; then lay in your Ice, and put in amongst it a Pound of Bay-Salt; set in your Pots of Cream, and lay Ice and Salt between every Pot, that they may not touch; but the Ice must lie round them on every Side; lay a good deal of Ice on the Top, cover the Pail with Straw, set it in a Cellar where no Sun or Light comes, it will be froze in four Hours, but it may stand longer; then take it out just as you use it; hold it in your Hand and it will slip out. When you wou’d freeze any Sort of Fruit, either Cherries, Raspberries, Currants, or Strawberries, fill your Tin-Pots with the Fruit, but as hollow as you can; put to them Lemmonade, made with Spring-Water and Lemmon-Juice sweeten’d; put enough in the Pots to make the Fruit hang together, and put them in Ice as you do Cream. An early reference to ice cream given by the Oxford English Dictionary is from 1744, reprinted in a magazine in 1877. "1744 in Pennsylvania Mag. Hist. & Biogr. (1877) I. 126 Among the rarities..was some fine ice cream, which, with the strawberries and milk, eat most deliciously." The 1751 edition of The Art of Cookery made Plain and Easy by Hannah Glasse features a recipe for ice cream. 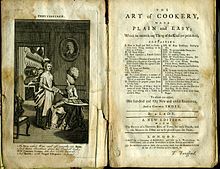 OED gives her recipe: "H. GLASSE Art of Cookery (ed. 4) 333 (heading) To make Ice Cream..set it [sc. the cream] into the larger Bason. Fill it with Ice, and a Handful of Salt." 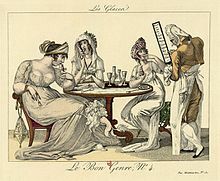 The year 1768 saw the publication of L'Art de Bien Faire les Glaces d'Office by M. Emy, a cookbook devoted entirely to recipes for flavoured ices and ice cream. Quaker colonists introduced ice cream to the United States, bringing their ice cream recipes with them. Confectioners sold ice cream at their shops in New York and other cities during the colonial era. Ben Franklin, George Washington, and Thomas Jefferson were known to have regularly eaten and served ice cream. Records, kept by a merchant from Catham street, New York, show George Washington spending approximately $200 on ice cream in the summer of 1790. The same records show president Thomas Jefferson having an 18 step recipe for ice cream. First Lady Dolley Madison, wife of U.S. President James Madison, served ice cream at her husband's Inaugural Ball in 1813. Small-scale hand-cranked ice cream freezers were invented in England by Agnes Marshall and in America by Nancy Johnson in the 1840s. The most popular flavours of ice cream in North America (based on consumer surveys) are vanilla and chocolate. In the Mediterranean, ice cream appears to have been accessible to ordinary people by the mid-eighteenth century. Ice cream became popular and inexpensive in England in the mid-nineteenth century, when Swiss émigré Carlo Gatti set up the first stand outside Charing Cross station in 1851. He sold scoops in shells for one penny. Prior to this, ice cream was an expensive treat confined to those with access to an ice house. Gatti built an 'ice well' to store ice that he cut from Regent's Canal under a contract with the Regent's Canal Company. By 1860, he expanded the business and began importing ice on a large scale from Norway. Agnes Marshall, regarded as the "queen of ices" in England, did much to popularize ice cream recipes and make its consumption into a fashionable middle-class pursuit. She wrote four books: Ices Plain and Fancy: The Book of Ices (1885), Mrs. A.B. Marshall's Book of Cookery (1888), Mrs. A.B. Marshall's Larger Cookery Book of Extra Recipes (1891) and Fancy Ices (1894) and gave public lectures on cooking. She even suggested using liquid nitrogen to make ice cream. Ice cream soda was invented in the 1870s, adding to ice cream's popularity. The invention of this cold treat is attributed to American Robert Green in 1874, although there is no conclusive evidence to prove his claim. The ice cream sundae originated in the late 19th century. Several men claimed to have created the first sundae, but there is no conclusive evidence to support any of their stories. Some sources say that the sundae was invented to circumvent blue laws, which forbade serving sodas on Sunday. Towns claiming to be the birthplace of the sundae include Buffalo, Two Rivers, Ithaca, and Evanston. Both the ice cream cone and banana split became popular in the early 20th century. The first mention of the cone being used as an edible receptacle for the ice cream is in Mrs. A.B. Marshall's Book of Cookery of 1888. Her recipe for "Cornet with Cream" said that "the cornets were made with almonds and baked in the oven, not pressed between irons". The ice cream cone was popularized in the US at the 1904 World's Fair in St. Louis, MO. The history of ice cream in the 20th century is one of great change and increases in availability and popularity. In the United States in the early 20th century, the ice cream soda was a popular treat at the soda shop, the soda fountain, and the ice cream parlor. During the American Prohibition, the soda fountain to some extent replaced the outlawed alcohol establishments such as bars and saloons. Ice cream became popular throughout the world in the second half of the 20th century after cheap refrigeration became common. There was an explosion of ice cream stores and of flavours and types. Vendors often competed on the basis of variety: Howard Johnson's restaurants advertised "a world of 28 flavors,” and Baskin-Robbins made its 31 flavors ("one for every day of the month") the cornerstone of its marketing strategy ( The company now boasts that it has developed over 1000 varieties). One important development in the 20th century was the introduction of soft ice cream, which has more air mixed in, thereby reducing costs. The soft ice cream machine fills a cone or dish from a spigot. In the United States, chains such as Dairy Queen, Carvel, and Tastee-Freez helped popularize soft-serve ice cream. Baskin-Robbins would later incorporate it into their menu. Technological innovations such as these have introduced various food additives into ice cream, most notably the stabilizing agent gluten, to which some people have an intolerance. Recent awareness of this issue has prompted a number of manufacturers to start producing gluten-free ice cream. The 1980s saw thicker ice creams being sold as "premium" and "super-premium" varieties under brands such as Ben & Jerry's, Chocolate Shoppe Ice Cream Company and Häagen-Dazs. Ice cream is a colloidal emulsion having dispersed phase as fat globules. It is an emulsion which is in the end made into foam by incorporating air cells which is frozen to form dispersed ice cells. In the composition of ice cream ice crystals are of most importance as they give a desirable mouth feel. Ice cream is composed of water, ice, milk fat, milk protein, sugar and air. Water and fat have highest proportions by weight creating an emulsion. The triacylglycerols in fat are non polar and will adhere to itself by van der Waals interactions. Water is polar thus, emulsifiers are needed for dispersion of fat. Also ice cream has a colloidal phase of foam which helps in light texture. Milk proteins such as casein and whey protein present in ice cream are amphiphilic, can adsorb water and form micelles which will contribute to consistency. Sucrose which is disaccharide is usually used as a sweetening agent. Lactose which is sugar present in milk will cause freezing point depression. Thus, on freezing some water will be unfrozen and will not give hard texture. Before the development of modern refrigeration, ice cream was a luxury reserved for special occasions. Making it was quite laborious; ice was cut from lakes and ponds during the winter and stored in holes in the ground, or in wood-frame or brick ice houses, insulated by straw. Many farmers and plantation owners, including U.S. Presidents George Washington and Thomas Jefferson, cut and stored ice in the winter for use in the summer. Frederic Tudor of Boston turned ice harvesting and shipping into a big business, cutting ice in New England and shipping it around the world. Ice cream was made by hand in a large bowl placed inside a tub filled with ice and salt. This was called the pot-freezer method. French confectioners refined the pot-freezer method, making ice cream in a sorbetière (a covered pail with a handle attached to the lid). In the pot-freezer method, the temperature of the ingredients is reduced by the mixture of crushed ice and salt. The salt water is cooled by the ice, and the action of the salt on the ice causes it to (partially) melt, absorbing latent heat and bringing the mixture below the freezing point of pure water. The immersed container can also make better thermal contact with the salty water and ice mixture than it could with ice alone. The hand-cranked churn, which also uses ice and salt for cooling, replaced the pot-freezer method. The exact origin of the hand-cranked freezer is unknown, but the first U.S. patent for one was #3254 issued to Nancy Johnson on 9 September 1843. The hand-cranked churn produced smoother ice cream than the pot freezer and did it quicker. Many inventors patented improvements on Johnson's design. In Europe and early America, ice cream was made and sold by small businesses, mostly confectioners and caterers. Jacob Fussell of Baltimore, Maryland was the first to manufacture ice cream on a large scale. Fussell bought fresh dairy products from farmers in York County, Pennsylvania, and sold them in Baltimore. An unstable demand for his dairy products often left him with a surplus of cream, which he made into ice cream. He built his first ice cream factory in Seven Valleys, Pennsylvania, in 1851. Two years later, he moved his factory to Baltimore. Later, he opened factories in several other cities and taught the business to others, who operated their own plants. Mass production reduced the cost of ice cream and added to its popularity. The development of industrial refrigeration by German engineer Carl von Linde during the 1870s eliminated the need to cut and store natural ice, and, when the continuous-process freezer was perfected in 1926, commercial mass production of ice cream and the birth of the modern ice cream industry was underway. 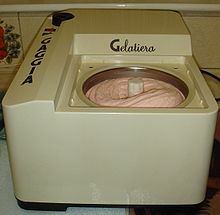 In modern times, a common method for producing ice cream at home is to use an ice cream maker, an electrical device that churns the ice cream mixture while cooled inside a household freezer. Some more expensive models have an inbuilt freezing element. A newer method is to add liquid nitrogen to the mixture while stirring it using a spoon or spatula for a few seconds; a similar technique, advocated by Heston Blumenthal as ideal for home cooks, is to add dry ice to the mixture while stirring for a few minutes. Some ice cream recipes call for making a custard, folding in whipped cream, and immediately freezing the mixture. Another method is to use a pre-frozen solution of salt and water, which gradually melts as the ice cream freezes. Borden's Eagle Brand sweetened condensed milk circulated a recipe for making ice cream at home. It may be made in an ice cube tray with the product, cream, and various simple flavorings. It can be ready to serve after as little as four hours of freezing. Fresh or frozen fruit, nuts, chocolate, and other ingredients may be added as well. An unusual method of making ice-cream was done during World War II by American fighter pilots based in the South Pacific. They attached pairs of 5-US-gallon (19 l) cans to their aircraft. The cans were fitted with a small propeller, this was spun by the slipstream and drove a stirrer, which agitated the mixture while the intense cold of high altitude froze it. B-17 crews in Europe did something similar on their bombing runs as did others. Ice cream can be mass-produced and thus is widely available in developed parts of the world. Ice cream can be purchased in large cartons (vats and squrounds) from supermarkets and grocery stores, in smaller quantities from ice cream shops, convenience stores, and milk bars, and in individual servings from small carts or vans at public events. In 2015, US produced nearly 900 million gallons of ice cream. Today, jobs specialize in the selling of ice cream. The title of a person who works in this speciality is often called an 'ice cream man', however women also specialize in the selling of ice cream. People in this line of work often sell ice cream on beaches. On beaches, ice cream is either sold by a person who carries a box full of ice cream and is called over by people who want the purchase ice cream, or by a person who drives up to the top of the beach and rings a bell. In the second method, people go up to the top of the beach and purchase ice cream straight from the ice cream seller, who is often in an ice cream van. In Turkey and Australia, ice cream is sometimes sold to beach-goers from small powerboats equipped with chest freezers. Some ice cream distributors sell ice cream products from traveling refrigerated vans or carts (commonly referred to in the US as "ice cream trucks"), sometimes equipped with speakers playing children's music or folk melodies (such as "Turkey in the Straw"). The driver of an ice cream van drives throughout neighborhoods and stops every so often, usually every block. The seller on the ice cream van sells the ice cream through a large window; this window is also where the customer asks for ice cream and pays. Ice cream vans in the United Kingdom make a music box noise rather than actual music. 55% to 64% water, which comes from the milk or other ingredients. These compositions are percentage by weight. Since ice cream can contain as much as half air by volume, these numbers may be reduced by as much as half if cited by volume. In terms of dietary considerations, the percentages by weight are more relevant. Even the low-fat products have high caloric content: Ben and Jerry's No-Fat Vanilla Fudge contains 150 calories (630 kJ) per half-cup due to its high sugar content. According to Canadian Food and Drug Regulations, ice cream in Canada must be at least 10 percent milk fat, and must contain at least 180 grams of solids per liter. When cocoa, chocolate syrup, fruit, nuts, or confections are added, the percentage of milk fat can be 8 percent. Ice cream is considered as a colloidal system. It is composed by ice cream crystals and aggregates, air that does not mix with the ice cream by forming small bubbles in the bulk and partially coalesced fat globules. This dispersed phase made from all the small particles is surrounded by an unfrozen continuous phase composed by sugars, proteins, salts, polysaccharides and water. Their interactions determine the properties of ice cream, whether soft and whippy or hard. Where r (0) is the initial size, n the order of recrystallization, t a time constant for recrystallization that depends on the rate R (in units of size/ time). To make ice cream smooth, recrystallization must occur as slowly as possible, because small crystals create smoothness, meaning that r must decrease. Around the world, different cultures have developed unique versions of ice cream, suiting the product to local tastes and preferences. The most traditional Argentine helado (ice cream) is very similar to Italian gelato, in large part due to the historical influence of Italian immigrants on Argentinian customs. Per capita, Australians and New Zealanders are among the leading ice cream consumers in the world, eating 18 litres and 20 litres each per year respectively, behind the United States where people eat 23 litres each per year. In China, besides the popular flavours such as vanilla, chocolate, coffee, mango and strawberry, many Chinese ice-cream manufacturers have also introduced other traditional Chinese flavours such as black sesame and red bean. In Iran, the most popular ice cream-like treat is faludeh (also called paloodeh, paludeh or fālūdhaj), which contains vermicelli noodles, sugar syrup and rose water. It's often served with lime juice and sometimes ground pistachios. In 1651, Italian Francesco dei Coltelli opened an ice cream café in Paris, and the product became so popular that during the next 50 years another 250 cafés opened in Paris. In Greece, ice cream in its modern form, or pagotó (Greek: παγωτό), was introduced in the beginning of the 20th century. India is one of the largest producers of ice cream in the world, but most of its ice cream is consumed domestically. In Indonesia, a type of traditional ice cream called es puter or "stirred ice cream" is made from coconut milk, pandanus leaves, sugar—and flavors that include avocado, jackfruit, durian, palm sugar, chocolate, red bean, and mung bean. In Iran, fālūde (Persian: فالوده) or pālūde (Persian: پالوده) is a Persian sorbet made of thin vermicelli noodles, frozen with sugar syrup and rose water. The dessert is often served with lime juice and sometimes ground pistachios. Italian ice cream, or gelato as it is known, is a traditional and a popular dessert in Italy. Much of the production is still hand-made and flavoured by each individual shop in "produzione propria" gelaterias. Gelato is made from whole milk, sugar, sometimes eggs, and natural flavourings. Gelato typically contains 7–8% fat, less than ice cream's minimum of 10%. Sorbetes is a Philippine version for common ice cream usually peddled from carts by peddlers who roam streets in the Philippines. Despite the similarities between the name sorbetes and sorbet, sorbetes is not a type of sorbet. In Spain, ice cream is often in the style of Italian gelato. 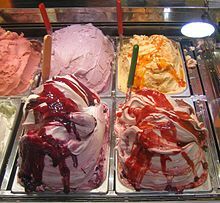 Spanish gelato can be found in many cafes or specialty ice cream stores. While many traditional flavours are sold, cafes may also sell unique flavours like nata, crema catalana, or tiramisu. Dondurma is the name given to ice cream in Turkey. Dondurma typically includes milk, sugar, salep, and mastic. In the United Kingdom, 14 million adults buy ice cream as a treat, in a market worth £1.3 billion (according to a report produced in September 2009). In the United States, ice cream made with just cream, sugar, and a flavouring (usually fruit) is sometimes referred to as "Philadelphia style" ice cream. Ice cream that uses eggs to make a custard is sometimes called "French ice cream". American federal labeling standards require ice cream to contain a minimum of 10% milk fat. Americans consume about 23 liters of ice cream per person per year — the most in the world. Mrs Marshall's Cookery Book, published in 1888, endorsed serving ice cream in cones, but the idea predated that. 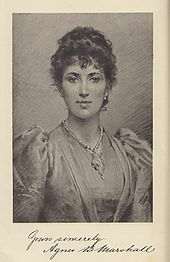 Agnes Marshall was a celebrated cookery writer of her day and helped to popularise ice cream. She patented and manufactured an ice cream maker and was the first person to suggest using liquefied gases to freeze ice cream after seeing a demonstration at the Royal Institution. Reliable evidence proves that ice cream cones were served in the 19th century, and their popularity increased greatly during the St. Louis World's Fair in 1904. According to legend, an ice cream vendor at the fair ran out of cardboard dishes. The vendor at the Syrian waffle booth next door, unsuccessful in the intense heat, offered to make cones by rolling up his waffles. The new product sold well and was widely copied by other vendors. Bananas Foster flaming ice cream. Kulfi from India with strawberry sauce. Ais kacang: a dessert in Malaysia and Singapore made from shaved ice, syrup, and boiled red bean and topped with evaporated milk. Sometimes, other small ingredients like raspberries and durians are added in, too. Booza: an elastic, sticky, high level melt resistant ice cream. Frozen custard: at least 10% milk fat and at least 1.4% egg yolk and much less air beaten into it, similar to Gelato, fairly rare. Known in Italy as Semifreddo. Frozen yogurt: made with yogurt instead of milk or cream, it has a tart flavour and lower fat content. Halo-halo: a popular Filipino dessert that is a mixture of shaved ice and milk to which are added various boiled sweet beans and fruits, and served cold in a tall glass or bowl. Ice cream sandwich: two (usually) soft biscuits, cookies or cake sandwiching a bar of ice cream. Ice milk: less than 10% milk fat and lower sweetening content, once marketed as "ice milk" but now sold as low-fat ice cream in the United States. Ice pop or ice lolly: frozen fruit puree, fruit juice, or flavoured sugar water on a stick or in a flexible plastic sleeve. Kulfi: believed to have originated in the Indian subcontinent during Mughal India. Maple toffee: Also known as maple taffy. A popular springtime treat in maple-growing areas is maple toffee, where maple syrup boiled to a concentrated state is poured over fresh snow congealing in a toffee-like mass, and then eaten from a wooden stick used to pick it up from the snow. Patbingsu - A popular Korean shaved ice dessert commonly served with sweet toppings such as fruit, red bean, or sweetened condensed milk. Sherbet: 1–2% milk fat and sweeter than ice cream. Snow cones, made from balls of crushed ice topped with flavoured syrup served in a paper cone, are consumed in many parts of the world. The most common places to find snow cones in the United States are at amusement parks. In 2006, some commercial ice cream makers began to use liquid nitrogen in the primary freezing of ice cream, thus eliminating the need for a conventional ice cream freezer. 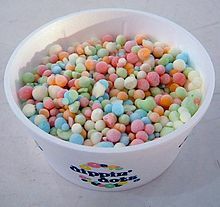 Brands are Dippin' Dots. The preparation results in a column of white condensed water vapour cloud. The ice cream, dangerous to eat while still "steaming" with liquid nitrogen, is allowed to rest until the liquid nitrogen is completely vapourised. Sometimes ice cream is frozen to the sides of the container, and must be allowed to thaw. Good results can also be achieved with the more readily available dry ice, and authors such as Heston Blumenthal have published recipes to produce ice cream and sorbet using a simple blender. Another vendor, Creamistry, creates ice cream from liquid ingredients as customers watch. 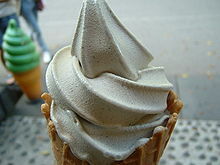 It has a softer texture than regular ice cream, because ice crystals have less time to form. ^ Beeton, Isabella (1911). Mrs Beeton's Cookery Book. pp. 258–60. ^ "Ice Cream Labeling: What Does it all Mean?". International Foodservice Distributors Association. Archived from the original on 14 May 2008. Retrieved 9 August 2008. ^ "Ice Cream's Identity Crisis". The New York Times. 17 April 2013. Retrieved 1 January 2017. ^ "Who Invented Ice Cream? - Ice Cream Inventor". www.icecreamhistory.net. Retrieved 31 August 2018. History of ice creams begun around 500 B.C. 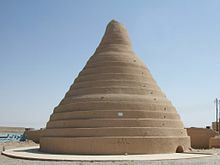 in the Persian Empire where ice was used in combination with grape juices, fruits, and other flavors to produce very expensive and hard to produce summertime treats. ^ The origin of ice-cream, BBC. Retrieved 26 October 2009. ^ Toussaint-Samat, Maguelonne (2005). A history of food. translated from the French by Anthea Bell. Malden, Massachusetts: Blackwell Publishing. pp. 749–750. ISBN 978-0-631-19497-2. OCLC 223367668. ^ Olver, Lynne (30 September 2007). "ice cream & ice". Food Timeline. Retrieved 9 August 2008. ^ Andrews, Tamra (2000). Nectar and Ambrosia:An Encyclopedia of Food in World Mythology. Santa Barbara, California: ABC-CLIO. p. 121. ISBN 978-1-57607-036-9. OCLC 224083021. ^ Tannahill, Reay (1989). Food in History. New York: Three Rivers Press. ISBN 0-517-88404-6. OCLC 32450569. ^ a b c d e Powell, Marilyn (2005). Cool: The Story of Ice Cream. Toronto: Penguin Canada. ISBN 978-0-14-305258-6. OCLC 59136553. ^ Goff, H. Douglas. "Ice Cream History and Folklore". Dairy Science and Technology Education Series. University of Guelph. Retrieved 9 August 2008. ^ Eales, Mary (1985) . Mrs. Mary Eales's Receipts. London: Prospect Books. ISBN 0-907325-25-4. OCLC 228661650. ^ "The History of Ice Cream - International Dairy Foods Association". www.idfa.org. Retrieved 14 March 2018. ^ "When You Celebrate Independence Day, Don't Forget the Ice Cream". International Dairy Foods Association. 27 June 2012. Retrieved 29 May 2014. ^ Walker, Harlan (1996). Cooks and Other People. Oxford Symposium. p. 283. Retrieved 7 March 2013. ^ "The Top 15 Most Popular Ice Cream Flavors". The Food Network. 30 July 2008. Retrieved 24 March 2012. ^ Calaresu, Melissa (August 2013). "Making and Eating Ice Cream in Naples: Rethinking Consumption and Sociability in the Eighteenth Century". Past & Present. 220: 35–78. doi:10.1093/pastj/gtt018. ISSN 0031-2746. Retrieved 24 March 2014. ^ Stephens, Nick (28 March 2007). "Wine Flavoured Ice Cream". Bordeaux-Undiscovered. Archived from the original on 27 July 2011. Retrieved 4 January 2009. ^ Stradley, Linda. "History of Ice Cream Cone". What's Cooking America. Retrieved 13 May 2008. ^ Weir, Robert. "An 1807 Ice Cream Cone: Discovery and Evidence". Historic Food. Retrieved 13 May 2008. ^ Weir, Robert J. "An 1807 Ice Cream Cone: Discovery and Evidence". Historic Food. Retrieved 9 August 2008. ^ Stradley, Linda (2004). "History of Ice Cream Cone". What's Cooking America. Retrieved 9 August 2008. ^ "History of Ice Cream Cones". Retrieved 24 November 2009. ^ "Haagen-Dazs: FAQ – Is Haagen Dazs Gluten Free?". Nestlé. Archived from the original on 2 February 2008. ^ "Colloidal and surface phenomenal aspects of ice cream". ^ Blumenthal, Heston. "Eggs". How to Cook Like Heston. Series 1. Episode 02. Channel 4. ^ Tharp, Ph.D., Bruce; Young, Ph.D., L. Steven (2013). Tharp and Young on Ice Cream (First ed.). Lancaster, PA: DEStech Publications. p. 410. ISBN 978-1-932078-68-8. Retrieved 30 December 2014. ^ Gobel, Greg (1 May 2015). "The Vought F4U Corsair". www.airvectors.net. ^ Rosenberg, Zach (August 2018). "DIY Ice Cream in Wartime". Air & Space/Smithsonian. Retrieved 22 August 2018. ^ "Flying Fortresses Double As Ice-Cream Freezers". The New York Times. 13 March 1943. Retrieved 22 August 2018. ^ "Dairy Products 2015 Summary" (PDF). United States Department of Agriculture. Retrieved 5 July 2016. ^ Goff, H. Douglas. "Ice Cream Ingredients". Dairy Science and Technology Education Series. University of Guelph. Retrieved 9 August 2008. ^ Kendall, Pat (25 June 2000). "Ice Cream – What's in a Scoop?". Colorado State University. Archived from the original on 30 May 2008. Retrieved 9 August 2008. ^ Branch, Legislative Services. "Consolidated federal laws of canada, Food and Drug Regulations". laws.justice.gc.ca. Retrieved 6 July 2017. ^ Arana, Ignacio (27 February 2012). Physical Properties of Foods: Novel Measurement Techniques and Applications. CRC Press. p. 385. ISBN 9781439835364. ^ Hartel, Richard W.; Douglass Goff, H. Ice Cream. New York: Springer. pp. 358, 359. ISBN 978-1-4614-6095-4. ^ "Business Outlook: ice cream manufacturing (based on a report to be found through www.ibisworld.com.au)". Reed Business Information. 2005. Archived from the original on 27 April 2006. Retrieved 3 March 2006. ^ Visser, Margaret (1999). Much Depends on Dinner (illustrated ed.). Grove Atlantic Press. p. 297. ISBN 978-0-8021-3651-0. Retrieved 13 May 2009. ^ "Restaurant Le Procope" (in Italian). procope.com. Retrieved 13 May 2009. ^ "Ice Cream – UK – September 2009". just-food.com. Aroq Ltd. September 2009. Retrieved 18 November 2009. ^ Weinstein, Bruce (1999). "Peach Ice Cream, Philadelphia Style". CondéNet, Inc., reprinted from William Morrow and Co.'s The Ultimate Ice Cream Book. Retrieved 24 September 2008. ^ "The Ice House – ice trade and ice cream". Retrieved 17 November 2009. ^ Weir, Robert J. (2004). "An 1807 Ice Cream Cone: Discovery and Evidence". Historicfood.com. Retrieved 4 January 2009. ^ Stradley, Linda (2004). "Ice Cream Cone, History of Ice Cream Cone". Whatscookingamerica.net. Retrieved 4 January 2009. ^ Eater, Picky (2004). "AsianWeek". Rice Noodles in Your Frozen Delights. Pan Asia Venture Capital Corporation. Archived from the original on 7 October 2007. Retrieved 4 November 2006. ^ Whickham, D. J.; King, H. R. 1969. "Regulation, Title 1 Agriculture and Markets, Section 39.12 Parevine; identity; label statements of ingredients." New York State Department of Agriculture and Markets (Albany, NY). 3 Feb.. Pp. 16–17. ^ "Mmmm...Cryogenically Frozen Ice Cream" (PDF). Cold Facts. 22 (3): 6–7. 2006. Archived from the original (PDF) on 31 March 2007. ^ Katherine Whaley (18 May 2017). "Creamistry mixes ice cream and science with delicious results". American Broadcasting Company. Retrieved 26 October 2017. Look up ice cream in Wiktionary, the free dictionary. This page was last edited on 6 April 2019, at 14:15 (UTC).